Many of you may know Patti already. 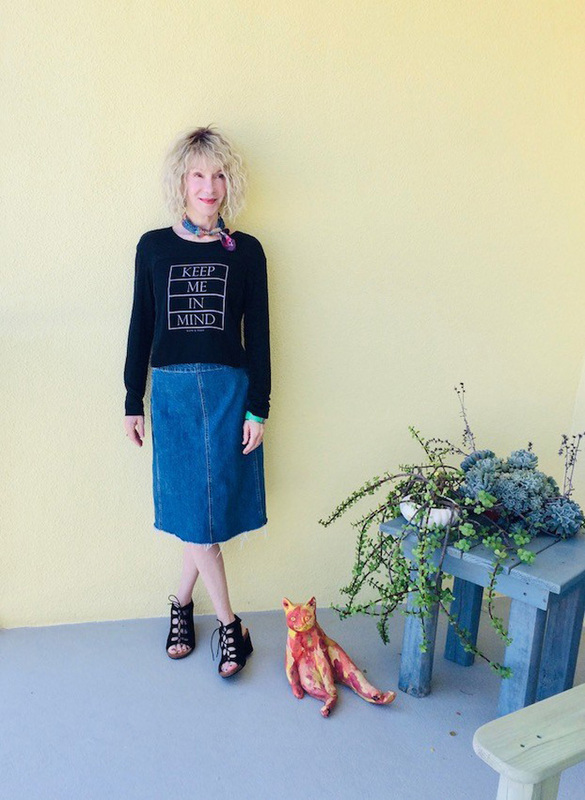 Originator of the popular Visible Monday where (especially 40+) women celebrate their style every 2nd week, she has been an important voice for the visibility of 40+ women. She also has a very unique style herself to which she stays very faithful. Patti knows what she likes and what looks good on her. Time to get to know some of her style secrets! I’m a midlife woman, happily married, child-free, and a crazy cat lady. My career has been in mental health for the last 20 years, and I love it. I am 58. Too many people know it for me to deny it! Can you tell us a bit more about your blog Not Dead Yet and why you created it? My friend Joni used the expression in a conversation, and it resonated with me. I borrowed “Not Dead Yet” with her permission, to express how I feel about being middle-aged. Not young, but not dead yet, and I still have plenty to say! I started the blog from my love of fashion/style as well as my strong feelings about how mid-life women are often treated in those fields. Your blog has become the ‘meeting point’ for a visibility party on every second Monday? Can you share the story behind it and how you see this party develop over the future? I first wrote about The Invisible Woman back in June 2011. I think I was grieving the loss of youthful beauty in an especially poignant way. I needed to turn my thinking around, and appreciate what midlife beauty has to offer. I wanted to share my ideas with other women, and hear from them about feeling Visible. We started with just three or four participants at Visible Monday, and now we have over 120! It’s so gratifying and so much fun to read all the Visible posts. I think I have a Classic-Casual-Modern-Feminine style, if that’s not too many adjectives! It’s easier to describe what I’m not: avant-garde, boho, conservative, or overly romantic. If I find an outfit veering too far into “feminine”, for instance, I add a man-tailored shirt or moto boots. If it’s looking too classic for my tastes, I have to wear a funky necklace or bracelet. Can you tell me where you live and how that influences your style choices? I live on the East Coast of Florida in a charming beach town. It definitely influences the casual-ness of my dress (no suits, no pantyhose, no heels) but I don’t fall into the surfer look either. I leave that for my husband. You are very consistent in your style with for example the A-line skirt a very regular part of it. Was your style always consistent or is this something you developed later in life? The internet exposed me to so much more eclectic fashion to choose from, and the second-hand stores allowed me to experiment with it! I am interested in the outlines of clothes, the juxtapositions of loose and fitted, modern and retro, high and low-end. I don’t play with color a lot, and I won’t claim to have an artist’s eye. I’m more analytical. I do spend a lot of time on Pinterest! I really enjoy examining the outfits other women put together, and taking inspiration from real life. I do! I know I look best in mostly “cool” colors and I avoid pastels and crayon-brights. In fact, I am a big fan of just black, gray, ivory, navy, and olive green for 90% of my wardrobe. Add in denim and the occasional burgundy, and we’re probably at 99%. I have a slim shape so I avoid over-large prints and voluminous tops (I do love a big skirt). I am more experimental now, by far. I take chances, I study more, I spend more time thinking about fashion. 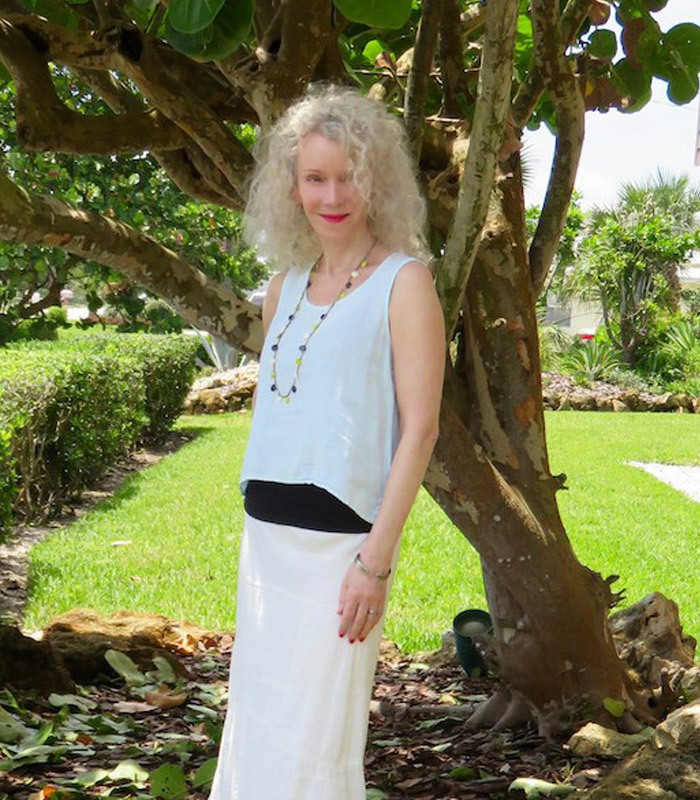 I am definitely having more fun in my 50’s, as my 20’s and 30’s were mostly spent in the “Dress For Success” uniforms of the day – boring! Only for myself; I don’t pass judgment on others and how they choose to express themselves. For me, the three guidelines are: nothing too tight, too short or too low-cut. And no Hello Kitty either. It’s human nature (I say this as a student of human nature) to care about how we look. When we don’t, it can even be a sign of depression. I am no longer interested in attracting a mate, but I care that I make a positive impression – that I look alive and interested in life. I like to feel approachable. Well, I must admit, it’s the ones in which I am having a “good hair day”! Other than that, I like the outfits that show I took a style chance, and changed up an old favorite. Like wearing a denim shirt with a tulle skirt, or cowboy boots with a dress. Denim and lace make a fun, surprising combination. A man’s shirt with a tulle skirt and funky boots. 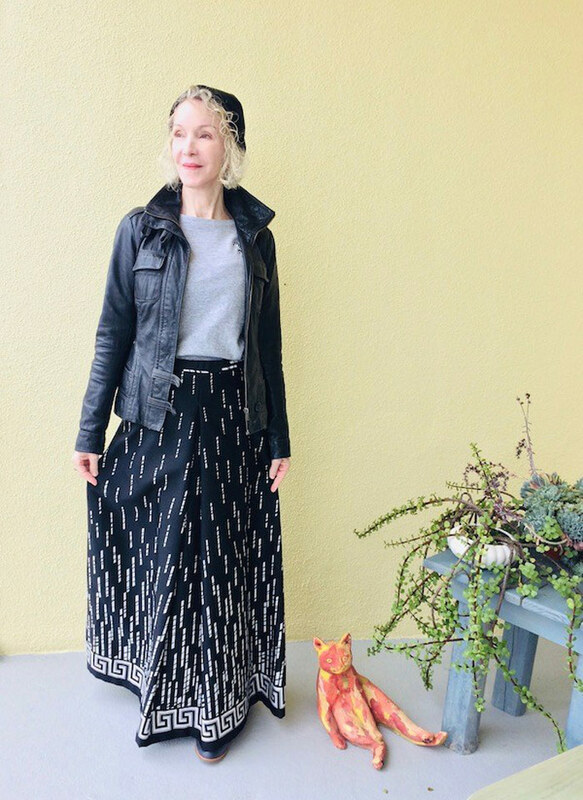 I think I don’t follow trends – but of course I do! I am always late to the party though. Just now I am liking colored jeans, for example. I like wide-legged trousers, midi skirts with booties, but you won’t see me soon in leather sweat pants. If you are interested in fashion/style, but are not a natural artist, devote some time to reading blogs, classic sites like style.com, and join Pinterest. By exposing ourselves to lots of looks, we can refine our own. Copy and modify, and look for a few truly personal pieces that make any outfit special to *you*. I am a part-time blogger, but I still look at it as an important slice of my life. I will probably continue to write as I do now, about style and life issues for mid-life women. I may stray into the political from time to time; I hope my readers will stick with me! I’d like to thank you, Sylvia. I adore your blog and the tremendous outreach you do. You speak in a genuine voice and it’s a pleasure working with you! Thanks Patti for a great interview! 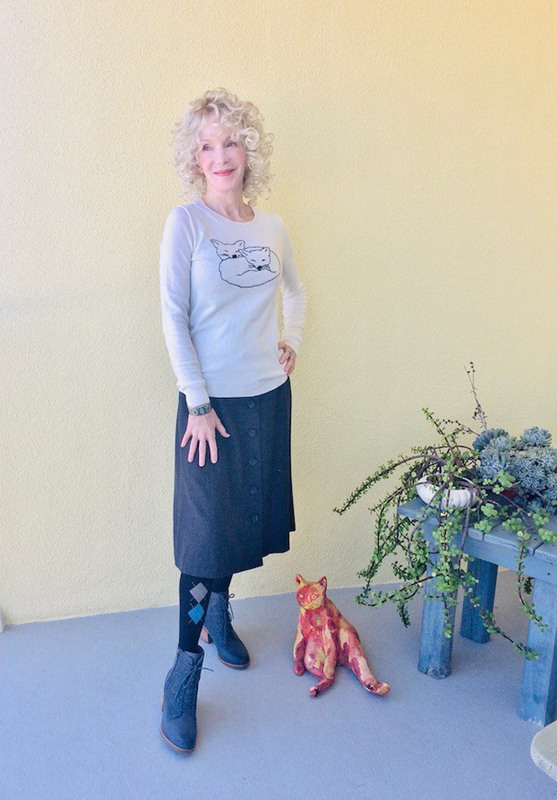 Be sure to check out Patti’s blog: Not Dead Yet Style! 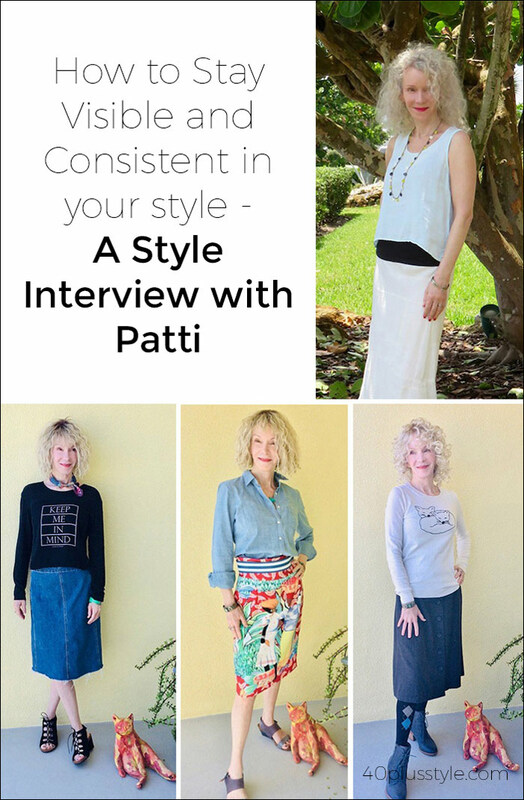 Which is your favorite of Patti’s outfits displayed above? Thanks again, Sylvia, for inviting me! Your blog is a daily read. It would be hard to choose which outfit, as they all are a bit different, yet there is a common thread! Fun, alive and yes, Patti, you are not dead yet! You look great and I love the way you pull things together. 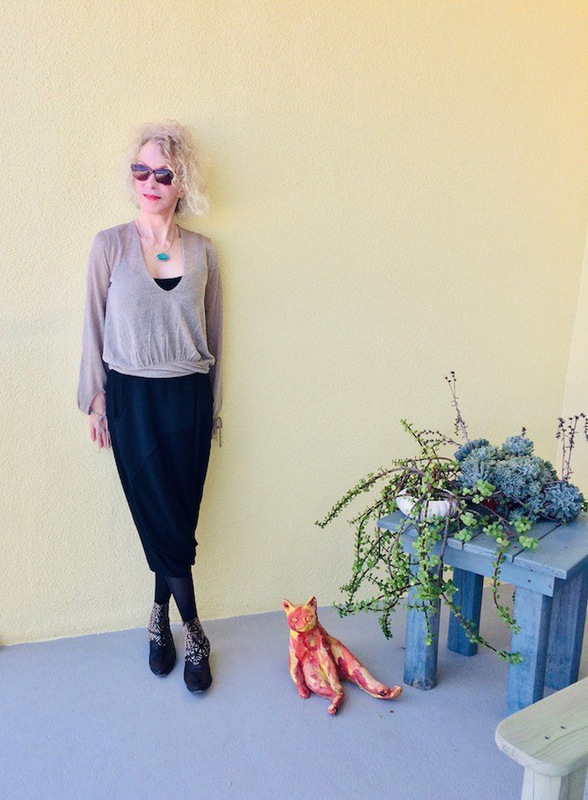 I met a very interesting French woman one afternoon while browsing through one of my fav places to get a bargain, and we both remarked about being invisible after 40…..well let me tell you, we both in our 60’s and like you, take pride in how we look and enjoy being able to pull off anything! Keep your beautiful sense of self and I look forward to checking out your blog. Sylvia, thanks again for another great interview! How I love Patti and what she brings to the blogging community. I got to know her a little better here. Wow! she makes 58 look fabulous! I always look forward to your interview posts, they are such a great way to see into a bloggers real life. I simply adore both you and Patti and it was wonderful reading bits a pieces of her life that were new to me. My favorite style of Patti’s is so easy to state, it’s the beautiful radiant smile. With that she makes everything look amazing. I adore Patti, her blog and Visible Monday. 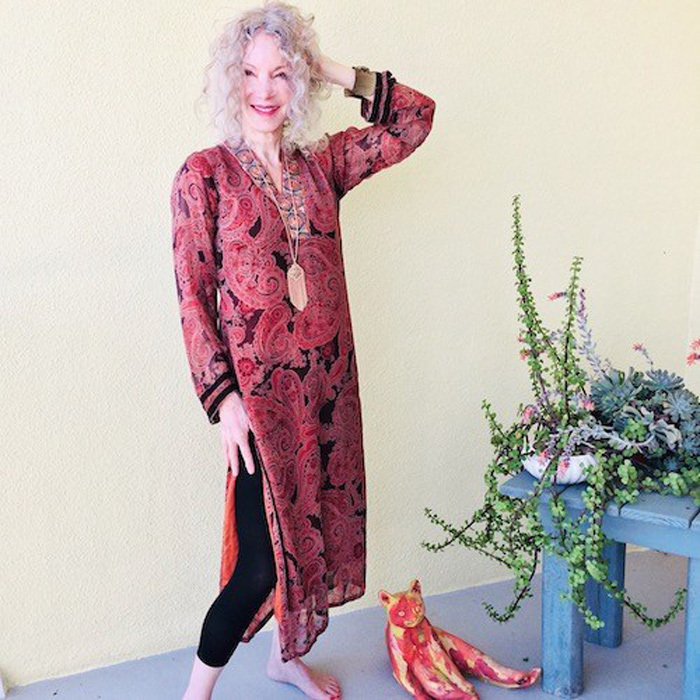 She is an important voice in the 40+ community and is always genuine, supportive and very stylish. Great interview, Sylvia! I look forward to your interview posts also. Patti is a treasure! Thanks for all the work you put into your projects Sylvia. We appreciate your efforts. Thank you for this interview. I have allways admitted Patty’s style and particular beauty. I cannot belive her age! Not entirely about this post, but I think it’s on topic. Definitely is in the spirit of of “Visible Mondays.” A friend posted this on Facebook and I thought it was wonderful. 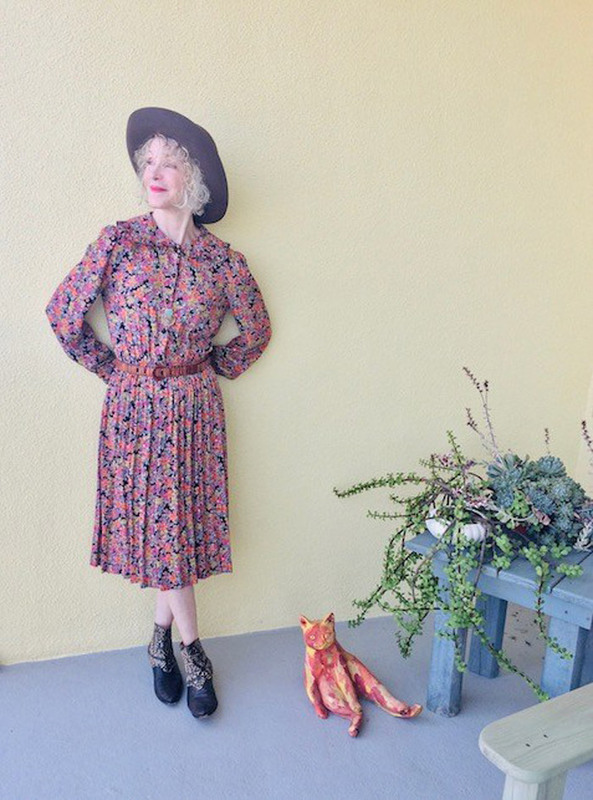 Six women, average age of 80, who are fashionistas — some on a budget, some not. http://www.youtube.com/watch?v=4znrNtLKDE4 Worth a watch. Fun and interesting to learn more about Patti! She is a generous and stylish lady indeed. The “Visible Mondays” has really made blogging fun for me, such a great group of supportive women. Thank you for doing this Patti and sure I not alone in my appreciation. Love your look and the fact you create interesting combinations, mix styles to create your own look. I think both of you are more interesting and truthful than any style magazine. Vive the fashion blogger! Ahh this just made me feel all warm and fuzzy inside about the great community we have as over 40 bloggers! I have met patti in person, and feel lucky to have done so! She has been made an important forum for us. AND Sylvia, you also have done wonders for our community! Thanks for this! Patti all your outfits are very beautiful and fabulous. Next post: Do you believe in dressing ‘age appropriately’ and what does it mean to you?